World O' Crap: What's This "And the Rest" Crap? A commenter just alerted me in the post below that Russell Johnson has died at the age of 89. Like a lot of people I first encountered him in endless after school reruns of Gilligan's Island (and even though I hated the show and hated myself for watching it, I nevertheless watched it faithfully, because it helped me to master the art of self-loathing, which I was pretty sure would come in handy if I ever decided to pursue a career in the Humanities). So it was jarring and delightful when I later discovered that he'd begun his career playing villains, mostly in westerns. 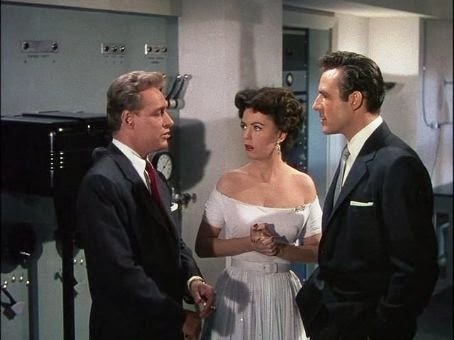 But he was also a familiar face in science fiction films (such as It Came From Outer Space and Attack of the Crab Monsters), and TV series (Twilight Zone, The Outer Limits, The Invaders). But fans of Mystery Science Theater 3000 will remember him best as the drunken, abusive, and quickly deceased stepfather in The Space Children, and the prickly but heroic egghead Steve Carlson in This Island Earth. 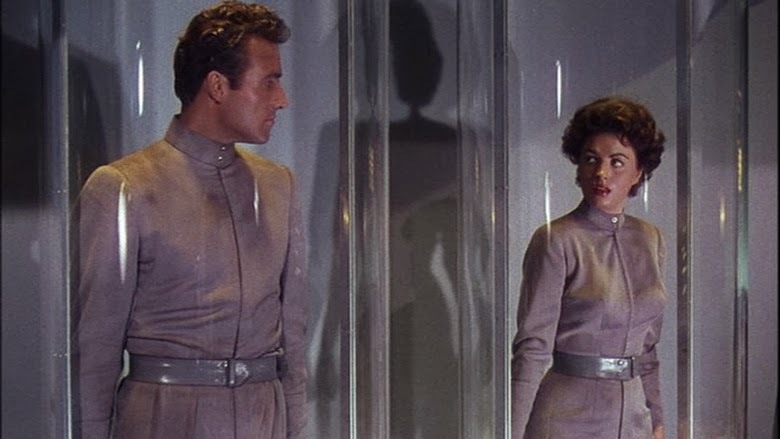 During the picture, as you may recall, Rex and leading lady Faith Domergue are placed in My Size plexiglas tubes, which are then filled with smoke, because Science! Naturally, the MST3K crew made a stoner joke, and after the movie an audience member asked Reason, "What was it like being inside the giant bong? Rex, who apparently played straight arrow types for a reason (see what I did there?) had no clue what a bong was, which occasioned the biggest laugh of the night when Johnson leaned over to him and whispered an explanation, while vividly and unmistakably miming the act of sparking up a little smoke on the water. This is perhaps not surprising when you realize that one of Russell's other films is The Saga of Hemp Brown. I'm sure Ivan will have something more enlightening to say, and unfortunately, I'm up to my armpits in on-rushing deadlines and roll-on deodorant, so I'm going to pull an Atrios and say, "Consider this an open thread for all your Russell Johnson-related recollections." He was a great mean drunk stepfather in Space Children. & I know my mean drunk stepfathers! "Brought to you by the hate council". Thanks for a great tribute post. Apparently Johnson finished his life here on Bainbridge Island - pretty close to where I live. I heard an actual in-his-voice sound bite on the radio today. He said that if he'd known then what would happen he wouldn't have taken the Professor part. I dearly loved the Professor--I even went to a Halloween party years ago dressed as him. I will always cherish his standard line (with numerous variations): "Skipper, I think I can help. I've constructed a crude nuclear reactor using coconut shells and parts from the radio ..."
The Professor (actually The Doctor--Roy Hinkley Phd-- you did know he had a name, didn't you?) was definitely an early hero of mine, as the level-headed problem solver of the group. This is what an Engineer does, after all, so no surprise that I became one. Naturally I loved the Professor's ingenuity in whipping up stuff like a stethoscope outta bamboo and coconuts. It always surprises me to learn that Gilligan's Island ran in first-run for only three seasons ('64 - '67. It seems like much more, perhaps owing to a combination of years being so much longer for a ten-year-old and the fact that TV series typically knocked out thirty or forty episodes a year. And maybe because it went into reruns for, like, forever. I learn from Russell's charming early-web-design-primitive website The Professor's Place that Dr Hinkley has a half dozen degrees, from USC, UCLA, SMU and TCU. I also note that Dr Hinkley taught High School science students. Let the Walter White jokes begin. Didja ever notice that Russell Johnson wore in the Gilligan show the exact same duds he wore in Space Children, shot in '58? And lastly, Russell Johnson has said that the question he is-- or rather was-- most often asked is why he couldn't ever put together a goddamn raft, or something, to get the castaways off the island, and invariably replied, "because it wasn't in the script, that's why, smarty pants." I always loved Russell Johnson, and he was one of the two cast members of "Gilligan's Island" I knew from non-Gilligan shows, because he always ended up on the reruns of Westerns my dad loved to watch. Amongst all the crazies on the island, the professor was the sanest of the bunch, and I always thought the show would end when everyone found out Professor had deliberately failed to get them off the island because he liked it there. Scott, you were so lucky to be there to see the bong incident! I had no idea you were at the event until now, but it's always been one of my "wish I had" moments. For me, Gilligan's Island was a chance to see Maynard G Krebs in a new show. I loved it, just like I loved The Many Loves of Dobie Gillis. Why didn't any of the endless parade of people who showed up on the island ever tell somebody "on the mainland" that there were people who needed to be rescued on the island? How many sociopaths are there in the world, anyway? How did Ginger and Mary Ann make all those coconut pies, when the only ingredient that they had for them was coconuts? And most importantly, would The Professor most like to be with Ginger or Mary Ann, and would the rejected girl be OK with ending up with The Skipper? Of course, nobody would ever end up with Gilligan. Ever. Last man on earth, etc. Stacia, John Gabriel was originally cast as the professor and played him in the pilot (never aired). The Suits at CBS thought he looked too young to have all the degrees earned by Dr Hinkley, so fare-thee-well John Gabriel, hello Russell Johnson. Anonymous, Jerry Van Dyke was originally offered the role of Gilligan, but turned it down, the dope-- he figured Gilligan's Island was unlikely to succeed, and then he accepted the lead role in My Mother the Car, which was every bit as dumb as it sounds, cancelled in the first season amid blistering reviews, and still regularly tops "worst sitcoms ever made" lists. And lastly: ahhhh, Ginger v Mary Ann. Dawn Wells (Mary Ann) got about three times the fan mail that Tina Loiuse (Ginger) did, and supposedly it created something of a feud between them. I watched My Mother the Car, too. We got two stations, NBC and CBS, and I watched whatever came on them fairly uncritically. Jerry Van Dyke probably would have made a pretty good Gilligan. Of course, I already knew him as Stacey Petrie. If it hadn't been for Chris' encyclopedic knowledge of tv trivia, though, I'd likely never have known that Jerry turned down the role of Gilligan to star in MMtC. That elevates what would have been merely a wrong call into the realm of epically bad decisions. Thanks for passing that along, Chris. That was a great anecdote about Russell and his TIE co-star, too, Scott. Poor Rex Reason: he always did come off as a bit of a stiff on-screen, so it's not all that surprising to find out he was like that in real life. 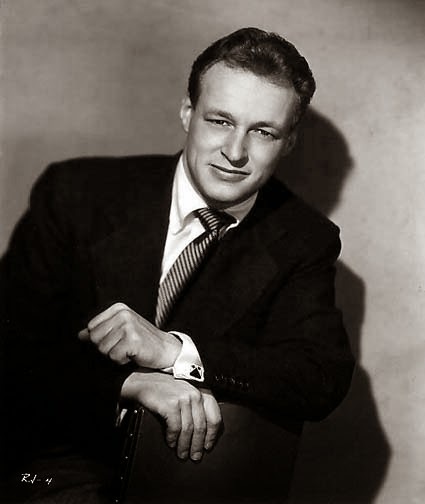 Anyway, like the other boomers here, Russell Johnson will always be The Professor to me, and yeah, he was kind of a role model. I'm not all that familiar with his work outside the sf genre, but he was indeed one startlingly nasty p.o.s. in The Space Children. I think he also did an excellent turn as an alien doppelganger in another great Jack Arnold flick: It Came from Outer Space. It must have seemed like old home week, when Arnold was hired to direct episodes of Gilligan's Island. Speaking of which, I can understand why Tina Louise got a bit miffed at her co-star. Considering that she'd starred on Broadway, studied under Lee Strasberg, and had some fairly major roles in films directed by the likes of Tony Mann, Andre De Toth and Michael Curtiz, it must have been galling to see a relative newcomer like Wells getting three fan letters to every one of hers. She should have expected it, though. Glamorous movie stars aren't very approachable, compared to wholesome girls-next-door like Mary Ann. Heck, I had a major pre-pubescent crush on Wells, myself. She's no doubt part of the reason why to this day petite brunettes can wrap me around their little finger. I liked My Mother the Car. Dave, darlin' heart... you would.